CAIRO, Egypt, (CNN)-- At least 75 people are confirmed dead and 70 injured in the collision of two passenger trains outside Cairo Thursday morning. 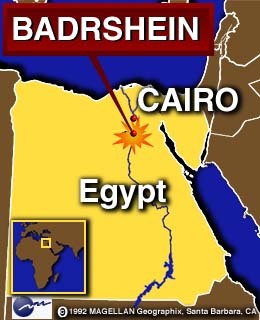 An express train en route from Cairo to Aswan apparently struck the rear of a regular passenger train stopped at a station in Badrshein, about 21 kilometers (13 miles) from the capital. As rescue workers began the grim task of searching for bodies, Badrshein villagers watched in disbelief, none understanding exactly what caused the two southbound trains to collide in heavy fog about 8:30 a.m. Passengers on the morning express train carrying factory workers say they remember only the screech of brakes, and then the crash. The second train was en route from the Cairo suburb of Giza to Beini Suef, to the south on the Nile River. Witnesses say the workers' train was going so fast that after impact it slid onto the top of the passenger train. The bodies of victims could be seen inside rail cars four hours after the crash. Medical officials scoured Badrshein asking for blood donations for the injured. Officials say they are still looking for an explanation for the morning tragedy. According to Egypt's Middle East New Agency, the initial investigation indicates that the engineer on the Cairo-Aswan train failed to respond to a signal to halt. Copyright © 1995 Cable News Network, Inc.